Help Me Roar! Hear Me Roar! 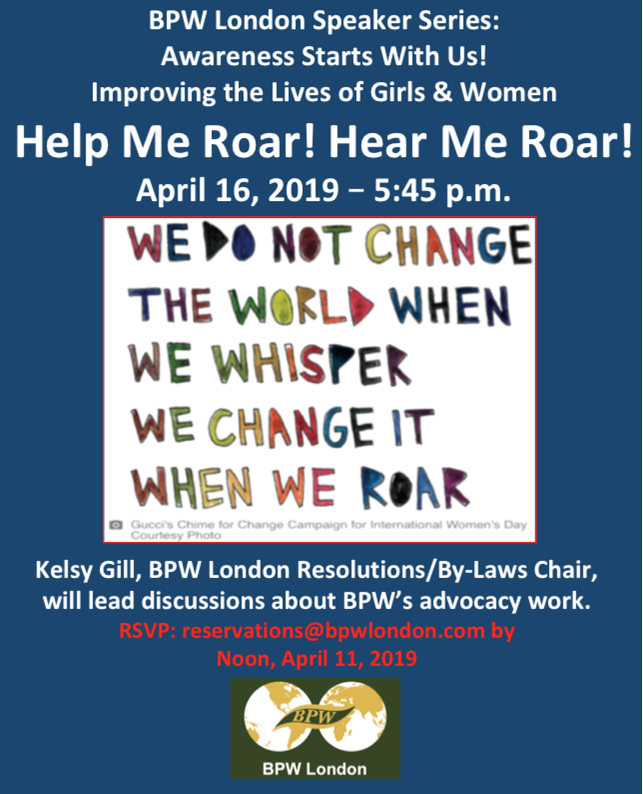 Kelsy Gill, BPW London Resolutions Chair will be leading discussions about BPW’s advocacy work. This dinner promises to be different than the ones you may have attended previously. Come and be excited by dinner and discussing issues to improve the lives of women. Family Style: Assorted wraps and sandwiches, vegetables, cheeses, fruit and more. $25 for BPW members; $30 for non-members. EBA Concrete Services is sponsoring the dinner. Please advise of any dietary restrictions when you RSVP. Please note reservations are guaranteed. Plans change and no longer able to attend? Email reservations@bpwlondon.com prior to the RSVP deadline, otherwise, you will be invoiced.